I saw this yesterday and just wanted to share these photos (with the permission of the fabulous knitter JillMott) - but how cute are these snakes? Now, I can say they're cute. Here in New Zealand we don't have snakes, so I don't know what it's like to live with snakes, but I thought these photos were particularly great. I have in the past been a little embarrassed about my very first pattern Snakes and Adders, and often forgotten I wrote it, not counting it amongst my published patterns. At the moment though, I am working on revisiting and reformatting a few of my earlier patterns and this one will have a wee edit soon. Maybe even be downloadable as a pdf! Whoa! But, we all have to start somewhere, right? So if you have remnants of yarn and little children to try and rustle up a Christmas present for, this free pattern might be useful. Knit a few, pop in a tissue box and voila! Hours of fun. This one knitted above was knitted by raveller JillMotts and is just one in a collection of snakes. She's put some great notes in her project too and interestingly she's stuffed it with yarn rather than using a pipe cleaner. The pattern is license free - if you want to make some to sell, gift, donate, whatever - that's fine by me. 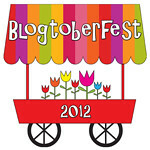 How am I doing for Blogtoberfest? Day 5 and 6 blog entries. Howzat! They look great Julia. I remember that pattern, would make some fab holiday entertainment too!